Great to see Asad Rehan back on board from 22 August having completed his training with ORDIT trainer Mark Crook. Asad originally joined the Platinum course and can look forward to an abundance of pupils - Birmingham is one of our busiest areas. Posted on June 30th, 2016 . Once again Surepass have met the strict criteria laid down in respect of Premises, Vehicles, Training and Administration, by the DVSA. The Senior Examiner conducting the individual ORDIT tests even commented that our trainer was "the best I've ever seen". So well done to Mark Crook from Birmingham and Vicki Hulse from Wigan who took their ORDIT tests. Posted on June 21st, 2016 . I was a truck driver getting up at silly times on a Monday and not getting home until Friday or Saturday. So I decided that I needed a better life balance and also sleep in my own bed at nights. The pressure was always on to make the delivery on time despite the road and weather conditions. After some research I decided that being a driving instructor would fit the bill. I signed you with BSM to do my part 1,2 and 3. At the time the training felt ok as with help I became an ADI. After passing my pt3 I became unhappy with BSM. I felt like a very small part of a big machine. I was working for them not them for me. They were making bookings in my diary for customers many miles away with no time to get between appointments, also there was not enough work provided to meet franchise costs. So in January 5 years ago I joined Surepass. The difference was remarkable. They were working for me, providing customers and letting me work my diary so that I was not chasing my tail trying to keep up all day. I could decide what hours and days to work. My life was back in balance. The big thing that helps is that we are all part of the same team, my view counts, Surepass is a family not a big machine, the directors Peter and Helen are always on tap to help you and you also build up a working relationship with the guys that answer the phones. As Surepass are advertising for you in your area and manning phones it leaves you to get on with your job Not unlit I did further training to become a senior trainer ( free of charge by the way) did I realise how haphazard and unprofessional the training with BSM was. With Surepass it's logically structured with clear easy to understand steps to follow. The backup you receive is second to none. All in Surepass understand the industry and are not managers appointed from other walks of life with little knowledge of what happens hour by hour out on the road. After starting my career as a Retail Manager I spent a number of years in The Canaries. Whilst abroad I was surprised and frustrated by the number of drivers who struggled at the roundabouts! So when I was moving back to the UK, I decided to train to be a driving instructor. I became a Surepass Franchisee because of the help and support that the team provides. They answer the phones and sort out all the admin, leaving me to enjoy instructing the learner drivers, and tackling those roundabout-phobias! I was a self-employed taxi driver, but had wanted to be a driving instructor for 15 years or so. I had shied away from booking an instructor’s course because of the prices. But family members encouraged me to book my course and take the leap. Two years on, and I am so pleased that they persuaded me. I thoroughly enjoy my job; and the support that Surepass provides, makes it easy. Posted on April 18th, 2016 . After being made redundant I decided to look at the potential to become self employed. 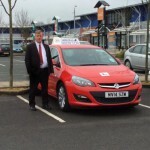 I considered a number of options including pub tenancy, as well as becoming a driving instructor. I decided to train to be a driving instructor as it provided more security than other options. 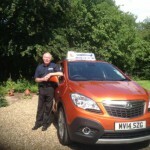 Having looked at a number of the driving school franchises, I signed-up with Surepass as they gave a lot more support than other companies and offered great value for money. I have been with Surepass since 2011 and particularly like that I have my own account manager, Sheila, who supports me all the way. Posted on January 18th, 2016 . My name is Mike Fairbrass, and I am a Senior Training Manager with Surepass and a fully qualified Approved Driving Instructor. I joined Surepass back in September 2008 and I'm based in Maidstone, down in the County of Kent. Immediately prior to Surepass, I was a Courier for both Business Post and Citylink. However, having performed well in that role for the best part of 8 years, the early 4:30am starts were gradually taking their toll on my health and so I opted for a career change. I had always believed that I was a good driver - Surepass made me an even better one. The quality of training, the dedication of the training managers and the support I have received over the past 6 years, is quite simply, second to none. There aren't many jobs in the world today where no two days are the same. The Customer Account Managers are amazing! Andy, Vicki, Michelle and Sheila regularly supply me with new pupils, and, with frequent referrals from existing pupils that have passed under my guidance, I'm so busy these days, that sometimes I wish there were 8 days in a week. Quite simply, I wish I had joined years ago, but I'm really looking forward to a long and prosperous career in this industry and couldn't wish for a better organisation alongside me. Posted on October 31st, 2015 . 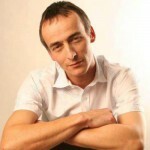 My name is Mark Crook and I am a senior training manager for Surepass limited. I live in a place called Solihull in the West Midlands ,which is close to Birmingham. I joined Surepass in July 2003 on one of their instructor training courses. Previously I had been employed as a sales development manager and owned petrol station franchise. I found whilst employed as a salesman was very good money but they treated me as if they owned me and I had enough. I had deliberated for a while about being a driving instructor and started to search around for a training school and I chose Surepass because they offered the best course and seemed to be a bit more personal and approachable . I am currently a senior training manager for the midlands and other areas. I also progressed over the years and currently hold several qualifications - DVSA grade 6 instructor, ORDIT(official register Of driving instructor training - last two inspections of a grade 6 standard), Cardington grade A and b-tec level 4 award in coaching for driver development. I am confident that I would not have achieved this without the help and support of Surepass. It was basically implemented by my Dad, about 5 years ago about being A Driving Instructor. I am a Carpenter & Joiner by trade and was in full time employment with a local construction company who specialise in architectural new builds and refurbished properties in the South West of England, when my Dad put the idea in my head! About being A Driving Instructor of which I pondered over and over, reminded me again and thought about the times I was made redundant 4 times and I was starting to suffer with my health with constantly working in harsh winters, I had to do something! I always had A passion for driving and took heed of my Dad's advice! Surepass wasn't my immediate decision, I shopped around first with the AA and Red, BSM and made my decision to train with Surepass Driving School who offered by far the best deal, after all these days everything comes down to money. I started my training in October 2012 and since qualifying as A Driving Instructor and being accepted by Surepass and have never looked back!